We are crushing on Ricky Lauren’s new cookbook, The Hamptons: Food, Family, and History. Her pasta with Hamptons summer vegetables is very similiar to Le Cirque’s Spaghetti Primavera recipe from 1977, found at bottom. In a large saucepan, over medium heat, add 2 tbsp olive oil and saute 1/3 cup of pine nuts and 2 cloves of minced garlic until golden brown, 2-3 minutes. Add 1 cup of sliced mushrooms and sweat for 2 or 3 minutes. Add a mix of lightly steamed vegetables (1 cup sliced green and yellow zucchini, 1 cup broccoli florets (try rapini), 1 cup baby carrots, 6 asparagus spears) 1 cup snap peas, 1 cup halved grape tomatoes, a half cup of basil, and salt and pepper to taste. Stir in 1/2 cup heavy cream, 1 cup of the parmesan, and another 1/4 cup basil. Maybe they were listenting to Barbra Streisand singing the love theme from A Star Is Born, or maybe they were getting down to Brick House. They may have been talking about Annie Hall or Star Wars while drinking Martini and Rossi Austi Spumanti. Whatever. If it was 1977, they were most certainly eating pasta primavera, made famous by Le Cirque and served well into the 1980s everywhere. Reviled now by some — Amanda Hesser says it became an absurdity of 1980s so-called seasonal cooking — others didn’t seem to mind its heavy cream sauce fighting with delicate spring veggies. Trim broccoli and break into florets. Trim off ends of the zucchini. Cut into quarters, then cut into 1-inch or slightly longer lengths (about 1 1/2 cups). Cut each asparagus into 2-inch pieces. Trim beans and cut into 1-inch pieces. Cook each of the green vegetables separately in boiling salted water to cover until crisp but tender. Drain well, then run under cold water to chill, and drain again thoroughly. Combine the cooked vegetables in a bowl. Cook the peas and pods; about 1 minute if fresh; 30 seconds if frozen. Drain, chill with cold water and drain again. Combine with the vegetables. In a skillet over medium-high heat, heat the peanut oil and add the mushrooms. Season to taste. Cook about 2 minutes, shaking the skillet and stirring. Add the mushrooms, chili and parsley to the vegetables. Serve equal portions of the spaghetti mixture in hot soup or spaghetti bowls. Spoon equal amounts of the tomatoes over each serving. Serve immediately. Serves 4 as a main course; 6 to 8 as an appetizer. 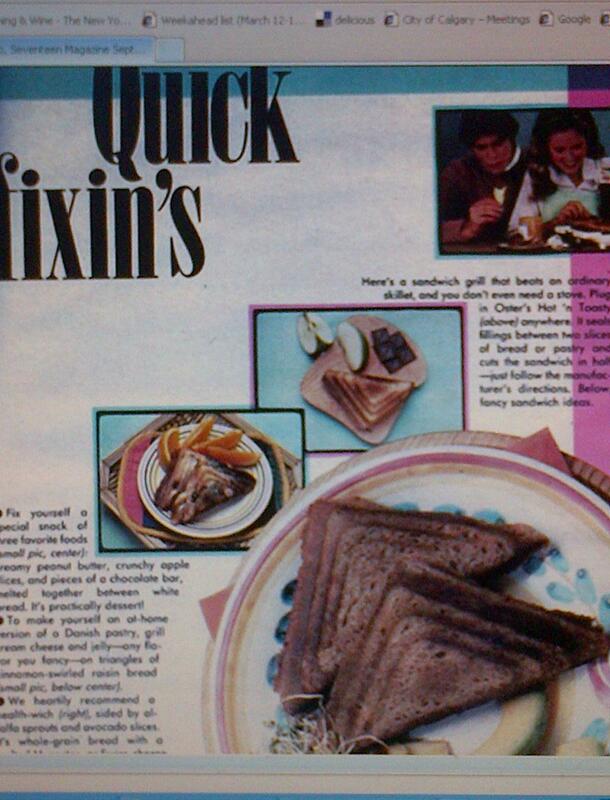 The March 1978 Seventeen recipe page for London broil, tomatoes and bread crumbs, ranch bread, and potato sticks (?) is a curiousity. 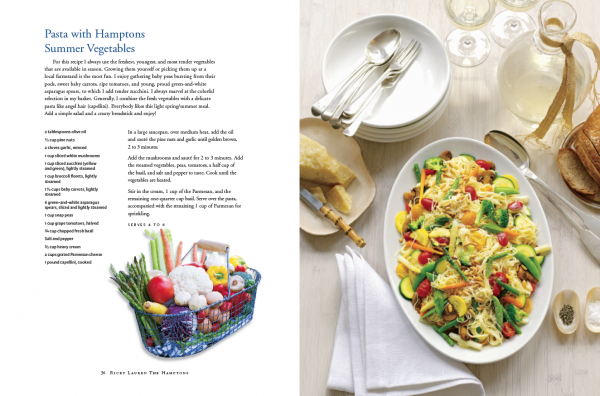 For now, we’ll just try this recipe from The Hamptons: Food, Family, and History by Ricky Lauren. To make the London broil: To make the marinade, mix together all the ingredients except the meat. Place the meat in a shallow dish and cover with the marinade. Cover with plastic wrap and refrigerate for at least 4 hours but no more than 24 hours. Remove the meat from the marinade (discard the marinade) and pat it dry with paper towels. 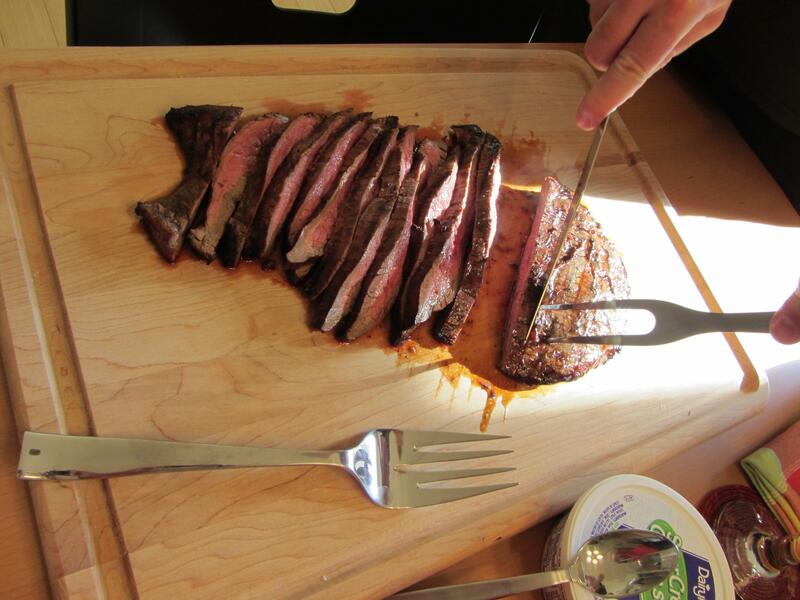 Grill (or broil on a broiler pan) on each side for 6 minutes for rare or 7 to 9 minutes for medium-rare. Transfer to a carving board and let stand for 8 to 10 minutes. Slice the meat at a 45-degree angle across the grain and serve with the horseradish sauce. To make the creamy horseradish sauce: Whisk all the ingredients together until smooth and creamy. Put in the refrigerator for at least 4 hours to allow the flavors to meld. Serve in a ramekin beside the meat. Yikes. 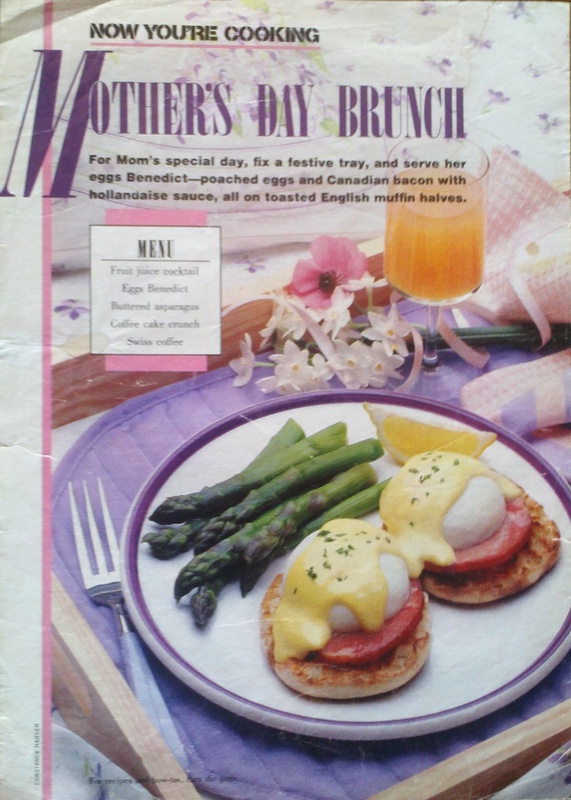 Look what passed for “cooking” in the early 1980s. 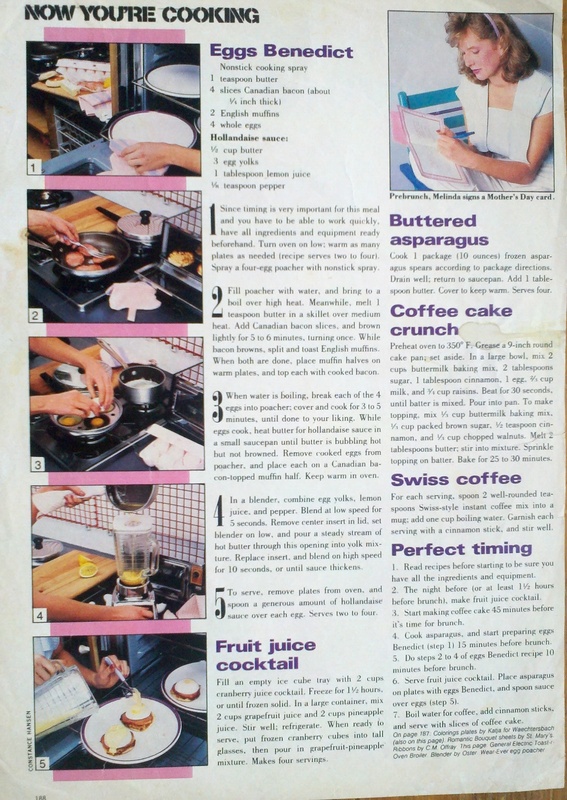 This hilarious “sandwich machine how to,” courtesy of Seventeen Magazine September 1982, is just too much. We must confess, somewhere in the depths, we have a similar sandwich press. Its sole purpose is for autostrato toasts: crisp little panini of soppressata, mortadella, provolone, dijon-garlic mayo, with warm marinara sauce on the side for dipping. 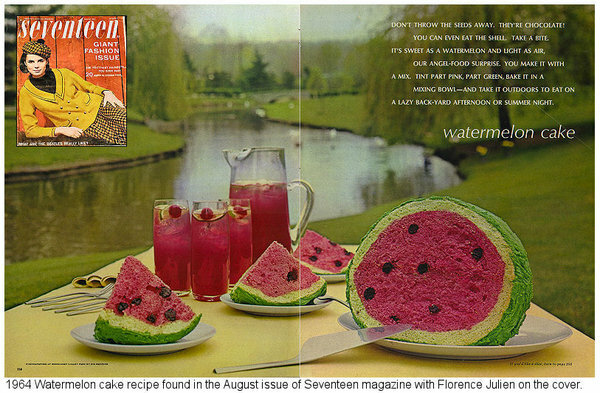 Can’t say we would ever make this, but in the interest in retro Seventeen recipes, we found this one online, year unknown. Toast two slices of bread on one side only. Place one slice of American cheese on untoasted sides and one slice of tomato on top, place in broiler or toaster oven (on broil setting) to melt cheese slightly and warm tomato. top with one or two slices of onion. Mix two egg yolks in small bowl with mayo and mustard, add salt and pepper to taste, should have a bit of zing to it. Whip two egg whites in bowl until peaks are barely stiff. Carefully mix in egg yolk mixture thoroughly but try to keep egg whites as stiff as possible. Pour mixture over toast, put in broiler again until egg mixture is lightly browned, should only be a couple minutes. Watch carefully. I know, I know. I’ve fallen down the retro rabbit hole. 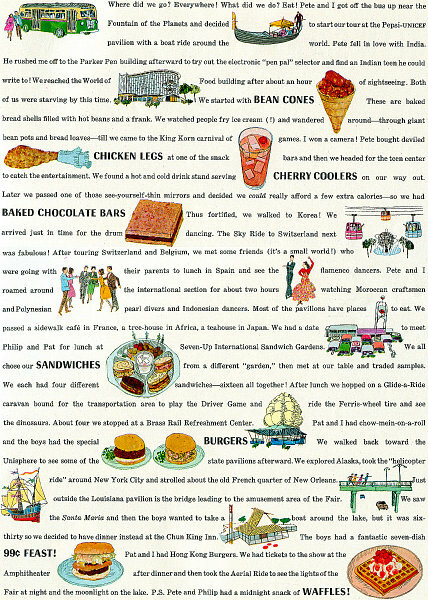 But here’s a summer-worthy treat featured at the NY World’s Fair. Sift together flour, salt and baking powder. Set aside. Cream butter until fluffy. Gradually beat in brown sugar, then egg and vanilla. Add sifted flour mixture, stirring with a spoon until well blended. Chill dough. Divide dough in half. Roll out one half to a 9 X 13-inch rectangle between two sheets of waxed paper. Remove one of the sheets from the dough and turn (dough-side down) into a 9 X 13-inch pan. Remove waxed paper. Arrange candy bars over dough to cover entire surface. Roll out remaining half of dough. Place on top of chocolate. Press dough against sides and corners of pan. Cool, then cut into 24 squares. It’s true. 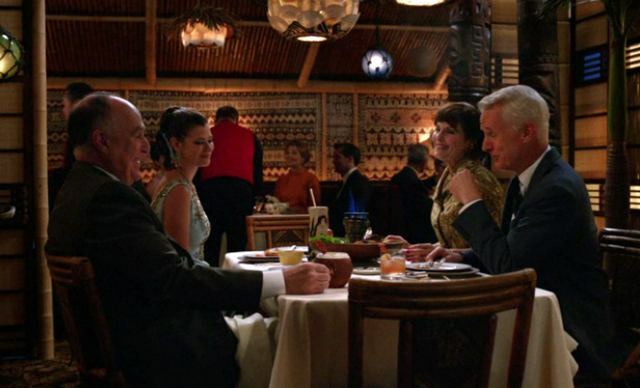 Mad Men at Trader Vic’s. Mai tais and crab rangoon. Chop crab meat and blend with cream cheese, steak sauce and garlic powder. Put ½ teaspoon of mixture in center of wonton. Fold square over cornerwise. Moisten edges slightly with beaten egg and twist. Deep fry until golden. Serve hot. Hooray for spring but more importantly, hooray for moms.